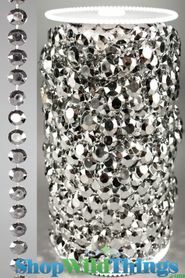 Our Silver Diamonds Metallic Beaded Curtain now comes in a 12' length and features bright and shiny faceted beads that sparkle and shine and shine and shine! You'll be amazed at how bright and beautiful this curtain is. 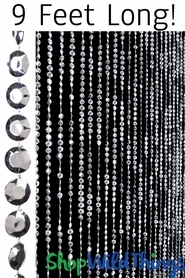 There are 34 strands of beads hanging from one curtain rod. The top of the rod features 2 eyelets for easy hanging. For convenience (while hanging or even customizing) these eyelets slide back and forth on the top of the rod. It seriously takes 2 minutes to hang these up from 2 nails or 2 hooks. 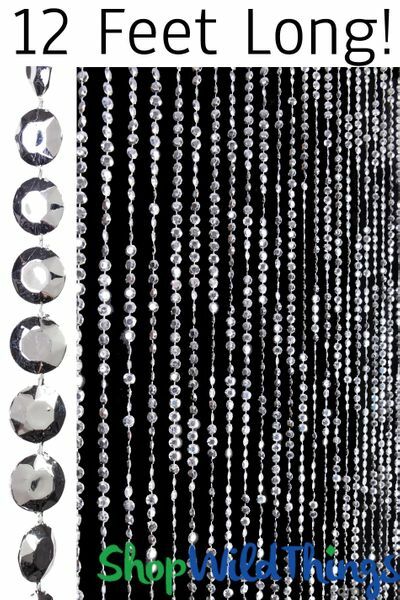 This Silver Diamonds Beaded Curtain is 3 Feet Wide and 12 Feet Long, making it ideal for tall ceilings and larger spaces! You can also trim the beads if you need them shorter or if you'd prefer a scalloped design - just grab a pair of scissors! This curtain matches perfectly with our 6' and 9' long curtains. 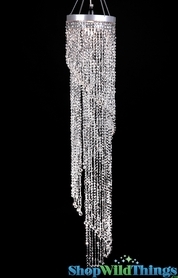 Create a gorgeous display by staggering the 3 different sizes one in front of the other - STUNNING! 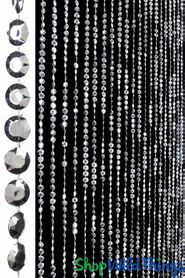 Beaded Curtains are beautiful for using as a backdrop at parties, events or window displays and in your home on walls, doorways and for all types of spaces. You can make them into a room divider by hanging a couple next to each other or use them behind a bed to create a headboard. 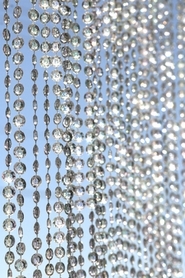 Use Beaded Curtains as photo backdrops. Our "Door Beads" are for so much more than doors!